Barghouti was at Ben Gurion International Airport in Israel on Wednesday when airline staff informed him that he wouldn’t be flying despite holding valid travel documents, according to the Arab American Institute, a Washington-based advocacy group that arranged the trip. He was told that U.S. immigration officials had ordered the U.S. consul in Tel Aviv to deny him permission to enter the United States. “Barghouti was not provided an explanation for his denial of entry beyond ‘immigration matter,’ ” the Arab American Institute said in a statement. 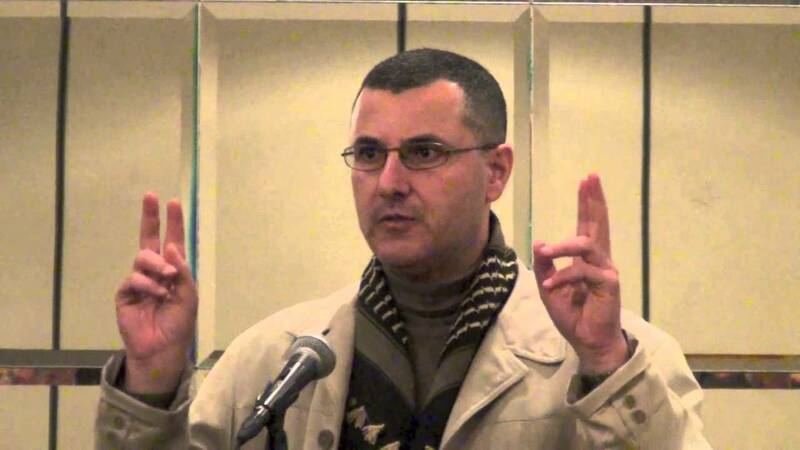 The group said Barghouti typically faces travel hurdles from Israel — not the United States. He has a master’s degree from Columbia University and spent a decade in the U.S. in the 1980s. He also has a second master’s degree as well as a PhD from Tel Aviv University. I am not sure why NPR chose not to mention this, but it sure shows the hypocrisy of the man who co-founded the movement advocating an academic boycott of Israeli institutions, scholars, and studies. Be that as it may, the BDS movement is furious. Let’s have a closer look at Barghouti’s statement. I have marked the really telling parts. As you can see, Barghouti has gone out of his way to show his movement is not antisemitic, as is implied by his deliberate mentions of synagogues (as destinations for his talks), and Jews in intersectional movements linked to BDS. Actually, he does not say “Jews”, he says “Jewish millenials” – this is deliberate, because he recognizes that millenials are the critical demographic. 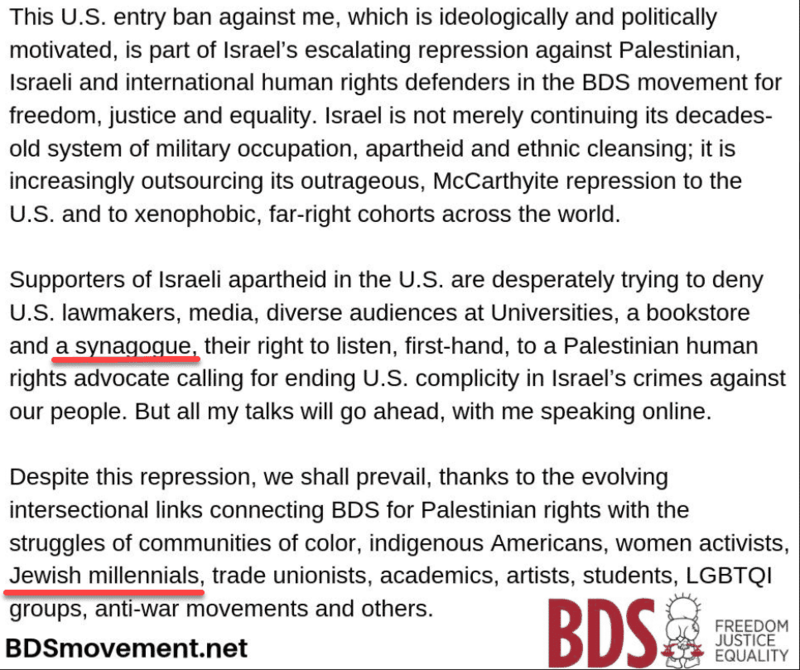 Unfortunately, there are way too many Jewish millenials who do support BDS, thanks partly to the bias they are exposed to from the academics entrusted with their education. This does not make BDS any less antisemitic; singling out the world’s only Jewish state for shameful treatment should clue you in, and you need only have read my anti-Zionist-not-antisemite series to understand that hatred of Israel and hatred of the Jewish people almost always go hand-in-hand. 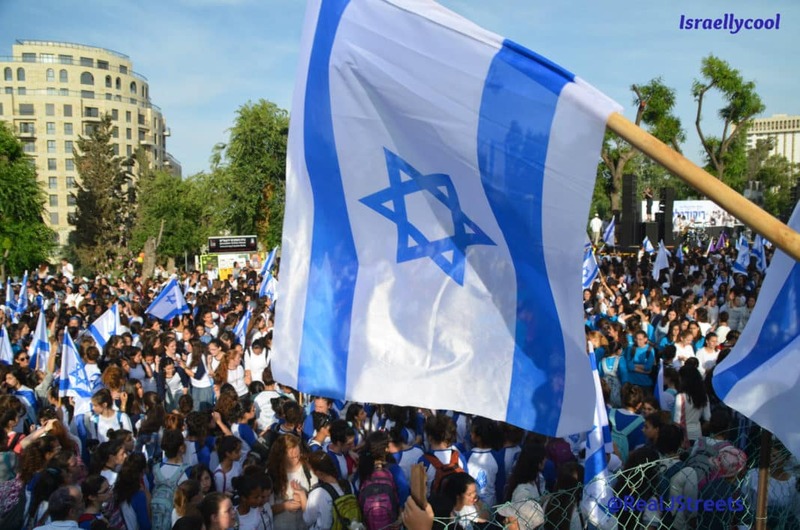 Jewish members of the BDS movement are useful tools, nothing more. Either way, this is a setback for the vile BDS movement. Here’s to many more.